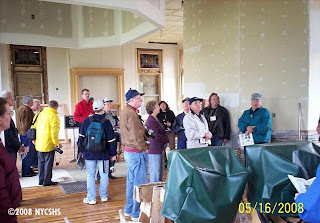 During the NYCSHS Annual Meeting in Cleveland, Ohio, some members had the chance to visit areas along the old Toledo & Ohio Central. 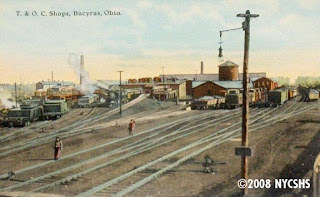 This is an early postcard view of the T&OC (NYC) Eastern District passenger station at Bucyrus, OH. Also showing in the background is the signal tower for the junction and multiple crossing diamonds over the PRR Main Line and the PRR Sandusky Branch. This was a railroad location later named “COLSAN,” which name remains to this day, but merely upon a blue sign. 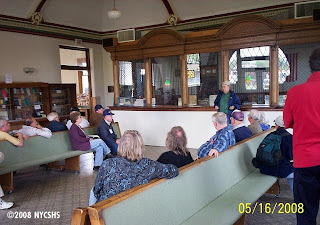 During our Convention Tour, we visited the station, which has undergone a super restoration effort by local folks. 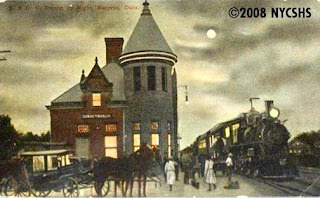 Bucyrus, Ohio is located on the T&OC Eastern Division Line between Toledo (Stanley) OH and Thurston, OH, where it rejoins the Western Div. of the T&OC -which passes through Columbus. 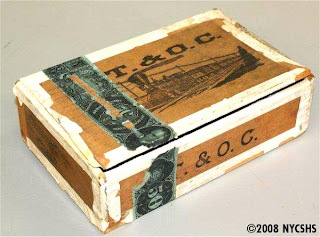 A concise capsule description of the T&OC and history of the many Ohio Central Lines of the NYC can be found on pages 449 through 452, inc. in “Steam Locomotives of the New York Central Lines, Volume 2“, which is still available from the Society. 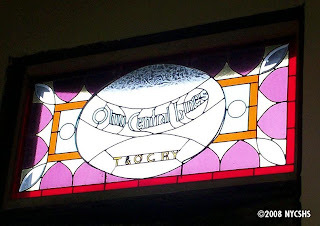 Below are some additional pictures from our tour, postcard views, including the station at night, the yard and shops, and an interesting T&OC cigar box! 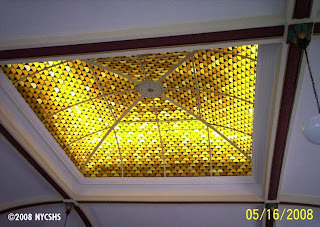 The yellow glass skylight was coated with soot, and also fully blackened for the duration of World War II. Local artisans delighted in restoring the skylight back to its original appearance so that its intricate design could be enjoyed once more. 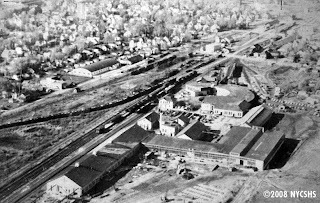 An airborne view of the complex at Bucyrus, Ohio. This entry was posted in Annual Convention, Research Information. Bookmark the permalink.